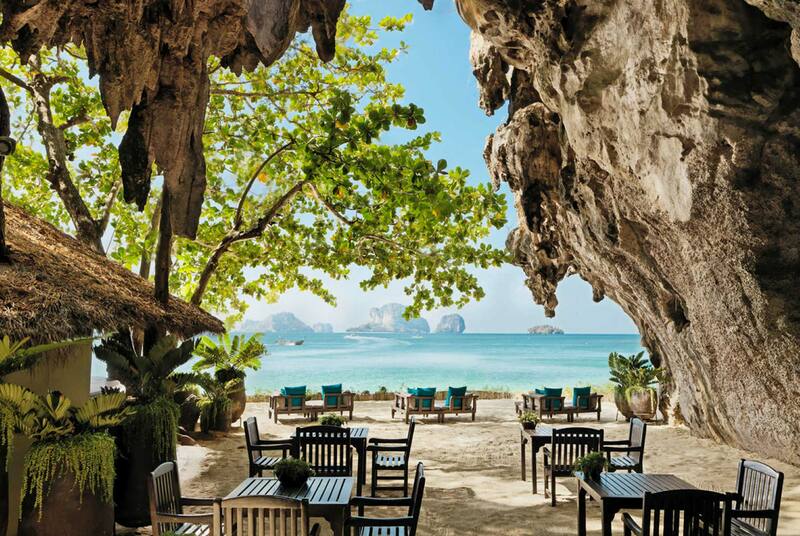 Krabi, located on Thailand’s southern west coast, looking out onto Phuket, is a magical province peppered with mangroves, sheer cliffs protruding out of emerald seas, tiny islands and paradise beaches. As such, it’s a wonderful choice to mark a special celebration, be it a wedding, milestone birthday, honeymoon, buddymoon or special anniversary. 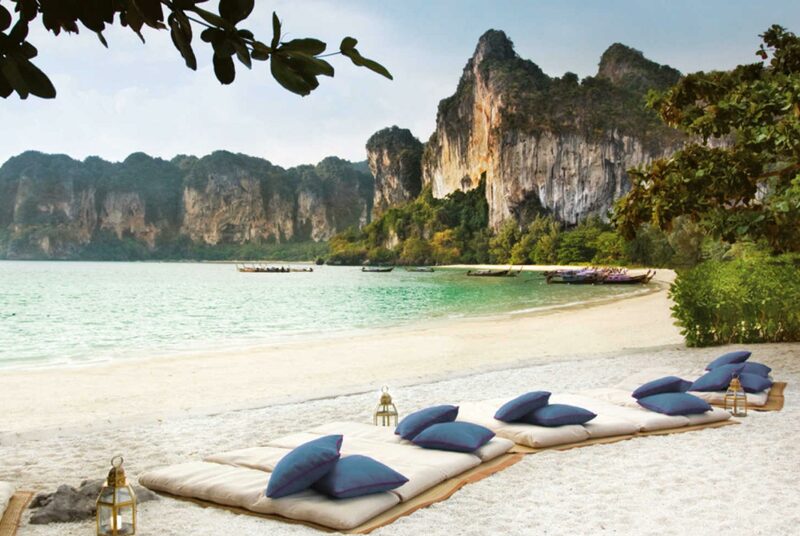 As well as breathtaking nature, it’s also home to some of Thailand’s most luxurious properties and has a lot to offer the LGBT+ luxury traveller seeking privacy and space. For those who desire peace and quiet with all the amenities, Rayavadee is an excellent choice. It’s situated on Railay, a peninsula only accessible by boat, so is great if you’re looking to get away from it all with loved ones. Each secluded, duplex villa is designed like a traditional Thai dwelling and is surrounded by jungle foliage for the ultimate privacy. The grounds are a lush tropical garden that is beautifully landscaped. It also has access to three beaches and adventurous guests can take part in trekking and climbing expeditions. Don’t miss the dining experience in a cave overlooking the ocean. Set near Klong Muang beach (one of Krabi’s best beaches), this property boasts magnificent views over the Andaman sea from each room’s private terrace. The private pool villas are enclosed with discreet foliage that blends perfectly into the surrounding jungle. Immaculately trained butlers are available to attend to your every whim to ensure your stay in comfortable and memorable. This resort sits on its own stretch of beach at Pai Plong Bay – the only resort in the bay – and cuts an impressive silhouette against the jutting limestone cliffs that sit behind the resort, their tropical foliage framing the property like a painting. Inside, the rooms are decorated in a contemporary Thai style and there’s a choice of beachfront or ocean facing villas. With only hotel guest allowed on the beach, it’s a great place to celebrate in privacy. This private villa comes complete with its own picturesque lake, overlooked by the property’s infinity pool. Its three bedrooms are housed in a traditional Thai-style wooden building that blends beautifully into the backdrop of limestone cliffs and jungle. Another larger property with five bedrooms is also available for larger groups. The interiors are a blend of traditional, hand-carved wooden features and contemporary comforts. It makes the perfect backdrop for a truly memorable celebration. 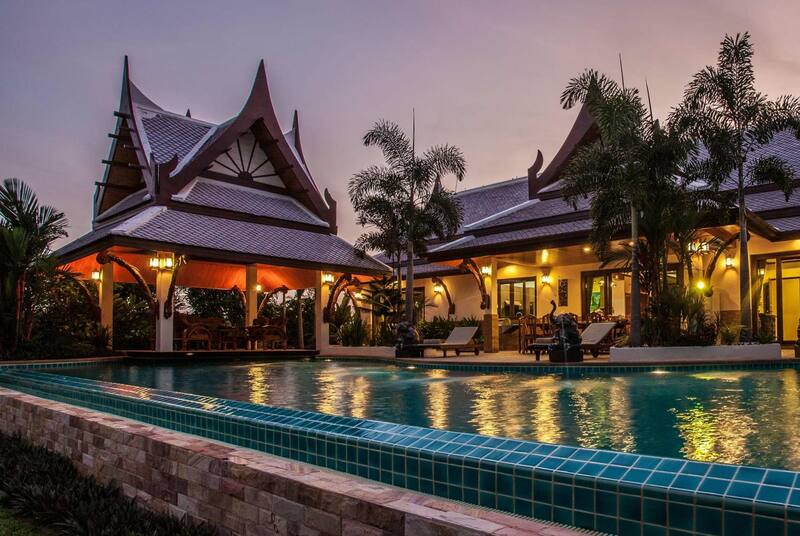 Located in the upmarket area of Klong Muang, this spacious villa encompasses three bedrooms, a generous living space and a private pool overlooking the Andaman sea. It’s set on a private road, making it an ideal venue for a small, private celebration, yet close enough to the amenities and attractions of the beach town.